Today’s Nice Price or Crack Pipe car seemingly doesn’t know if it wants to be a Saab or a Subaru. Either way, what you’ll have to figure out is whether or not it’s a good deal. As we all know, there’s a great sense of satisfaction that comes with pulling the thin, protective plastic film off of newly purchased items. the enjoyment is so engrained in my psyche that every time I see a BMW i3 with blue trim I get the itch to start scratching at it so I can peel it off. That same level of gratification may come from denuding yesterday’s 1989 Jeep Grand Wagoneer of its custom wrap. Obviously it was designed to appeal to someone’s personal taste, but the seller noted in the ad that it was a bit dinged up now anyway. You wouldn’t have to mar that satisfying activity by worrying about having paid the truck’s $4,700 asking either, since 57 percent of you deemed it Nice Price worthy. Okay, as fulfilling as it may be seem to strip that Jeep of its cloaking, underneath it’s still going to be a Grand Wagoneer, something to which most all of us are accustomed. The same however, can’t be said about today’s Canadian car which doesn’t seem to be able to make up its mind as to whether it’s a Saab or a Subaru. 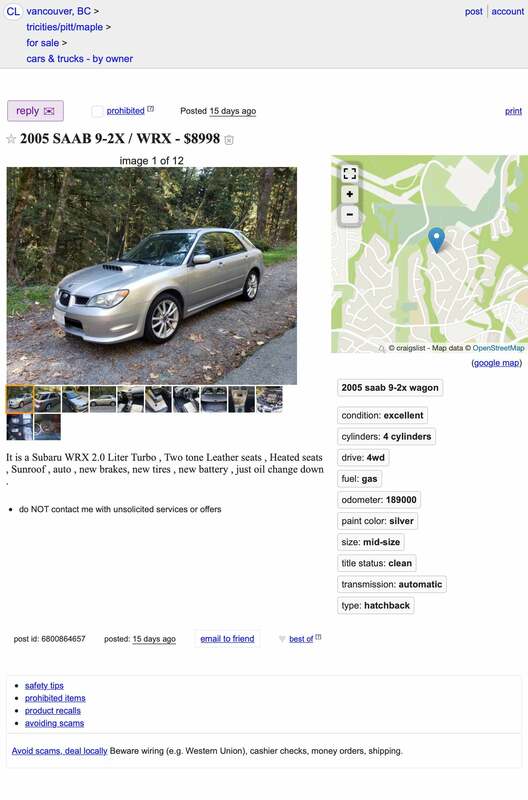 The ad introduces it as a 2005 Saab 9-2X/WRX. One look at the car however, and you note that, just like Forrest Gump, it ain’t right. Of course, owing to its odd provenance—a marriage of brands under GM’s transient ownership—everyone has long ago dubbed these cars “Saabarus.” This particular 9-2X Aero takes that homonym to new-found levels of WTF-ery. 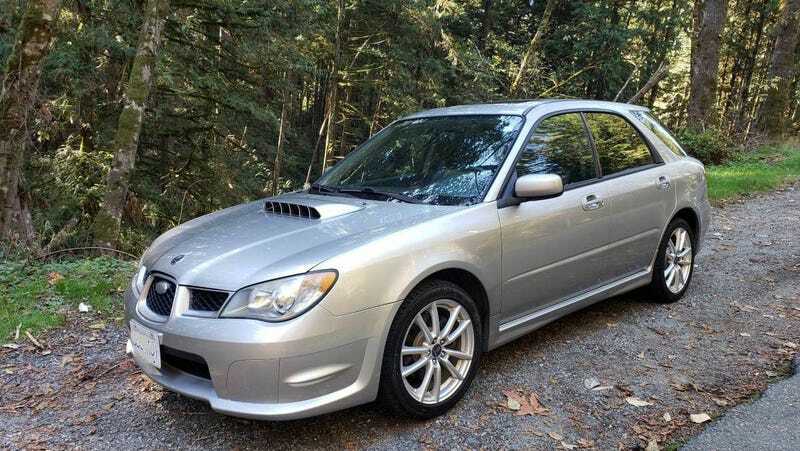 First off, what the hell is a 9-2X and why it it called a Saabaru? The car was the result of Saab’s then-parent, General Motors attempt to expand the brand’s lineup at the lowest cost possible. This resulted in Saab gaining their own versions of the Opel Vectra, Chevy Blazer, and in the case of the 9-2X Aero, the Subaru Impreza WRX wagon. The result was sort of like the cast of the old Saturday morning kid’s show Monster Squad, only without all the crime-solving. This one looks to be 80% 9-2X Aero and, owing to its front clip, 20% original Impreza WRX. It’s weird and of questionable logic, but it sure makes for one crazy car. The Impreza nose does provide for a larger air intake for the top-mounted intercooler, but the rest just seems out of place. This edition of the Subaru grille was supposed to pay homage to its parent, Fuji Heavy Industries’ aeronautical past. Most people however, just derided it as the “Flying Vag” and it was quietly retired from the company’s lineup after a couple of years. Of course it fits right in with Saab’s airplane heritage—Born of Jets and all that—and so might just work here. Or maybe not. The Saab nose carried its badge on the hood, while the Subaru edition placed it squarely in the Vag… er, grille. This car carries both, but with the Subaru star field painted over in an attempt to mask its identity like it’s Clark Kent or something. The headlamps are Impreza, as is the bumper below. The rest of the car— wheels, tail lamps, and badging—is all 9-2X Aero, as is the two-tone interior. The most amazing thing about the car is that it all looks to be in pretty great shape. That’s after obviously having some sort of surgery, and going 189,000 kilometers (about 117,000 miles). Yes, in addition to being a confusing mashup of marques, this Saabaru is also Canadian, and has its dashboard denoted in metric measurements. Here in the U.S. we consider base-10 to be too basic for our tastes, but I guess having a speedo that goes all the way up to “220” is a fair trade off for not knowing what’s going on. Luckily the gas gauge isn’t in metric. The engine is a 227 horsepower 2-litre turbo flat four, which puts it down through a four-speed automatic (yeah, boo, get over it) and Subaru AWD. The 9-2X Aero featured a number of upgrades over its WRX donor, including better sound deadening, fancier climate controls, and those cool black and parchment seats. Many might see this car’s Subaru front end as a retrograde step. I see it as one of life’s inscrutable mysteries. Or, maybe it was the result of an accident. If it’s the latter at least the car wasn’t totaled as it’s said to come with a clear title. What does such an enigma cost? The asking is $8,998 Canadian, which according to my handy-dandy conversion calculator translates to about $6,850 in U.S. greenbacks. Whether Loonies, American lucre, or whatever you use to make your misguided financial transactions, it’s now time for you to weigh in on this weird Saabaru’s value. What do you think, is it worth that $8,998 asking? Or, is this re-clipped 9-2X Aero just too dear to open up your money clip? Vancouver, BC Craigslist, or go here if the ad disappears. What&apos;s The Best Example Of Badge Engineering?